When folks think of Brazilian food, most probably picture slabs of beef, chicken and sausage over sizzling coals – the ‘churrasco’ that has become famous via the many Brazilian-themed steakhouses that have spread around the world, including places like Cleveland, New Orleans and Krakow, Poland. But the truth is that Brazilian food is not only about churrasco. Its cuisine is incredibly diverse, and it varies (like in the US) from region to region. In the south, you find ‘churrasco’ but also many other dishes inherited and adapted from the European immigrants that came to the region and made it their new home. In the southeast, the melting pot is so mixed that foods that originated from countries like Syria, Lebanon, Portugal, Italy and Japan have become so incorporated to the local food culture that people in the region identify them as their own. In the north and northeast, African, Dutch, Portuguese and Native Brazilian form a unique blend characteristic of this warm, mostly sun-drenched area. Unfortunately, few Brazilian restaurants (at least in my area) include dishes like moqueca, baião de dois and Ceará-style fish stew on their menus – probably because the vast majority of immigrants from Brazil hail from the south and southeast of the country. 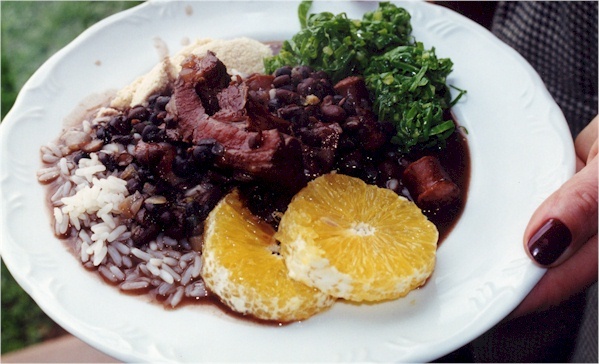 Then there is feijoada, Brazil’s most traditional dish, which is made with black beans and salted (or smoked) pork parts that may include feet, tail and nose. As legend has it, farm owners would serve roast pork during parties and then give the less desirable parts to their slaves, who would in turn cook them in a stew with black beans. Today, feijoada is the country’s signature dish, traditionally served on Saturdays with rice, collard greens and orange on the side. It is a time when families eat at leisure without having to worry about running back to work. One of my personal traditional favorites is Ceara-style stewed fish (peixada cearense), a delicious combination of seafood and veggies that is served with white rice and pirão, a gravy-like sauce made with yucca flour. Whenever I prepare this dish, I have fond memories of sitting in my grandmother’s living room and waiting – with anticipation – for dinner. 2 lb. Grouper fillets (or any other firm fish), 1 tbsp. Lime juice, 2 sliced onions, 1 green bell pepper, seeded and sliced, three ripe tomatoes, quartered, 4 tbsp. cilantro, chopped, 1 scotch bonnet pepper, seeded and chopped, 1 can coconut milk, three eggs, three large potatoes, two carrots, three thick slices cabbage, 2-3 tbsp. olive oil, salt and black pepper to taste. Boil the eggs, the carrots and potatoes in salted water until vegetables are done. Peel the carrots and potatoes, quarter them and reserve. Peel the eggs, cut in half and reserve. Wash the fish carefully and season with salt, pepper and lime and reserve. In a large pot, sauté the onions, peppers, cilantro and tomatoes in olive oil until tender Place the fish fillets over the sautéed vegetables and add the coconut milk. Simmer gently (do not stir) until fish is done (about 10 minutes), and add the potatoes, carrots, eggs and cabbage and simmer for another 5-7 minutes. Taste and add more salt if necessary. Serve over white rice. How to make pirão: Take about two cups from the cooked fish broth and bring to a boil in a small saucepan. Stir and slowly add about 1 cup of yucca flour (farina also works) and stir until the broth gets to an oatmeal-like consistency. Serve hot with fish. Pork’s nose isn’t include anymore.Dreied beef and also smoke ribs, together with pork shops are now included in most reataurants that feature the feijoada on Satardays.yu can also find, steam or boiled pumpkin, sweet potatos, fried manioc roots, colard greens and orange slices. Sounds like a great dish Ernesto. I’ll have to make it for Rod. Thanks for sharing. And it’s also very simple. With the exception of the yucca flour, all ingredients are easy to find.